Pill Boxes, Pill Cases, Pill Organizers with better design. 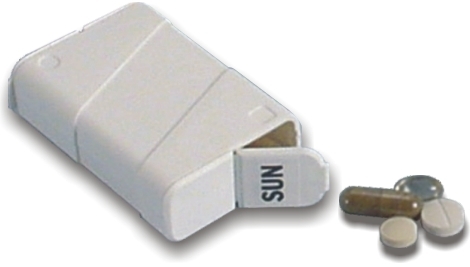 The VitaBuddy Pillbox can easily be opened from either end with the flip of a finger. This pill dispenser has two convenient compartments that hold up to 50 tablets. The VitaBuddy Pillbox is small enough to easily fit into your pocket or purse making it a cinch to bring your daily vitamins or medicines to work with you. If you are interested in preparing your supplements for the whole week, a Weekly Organizing Tray, which uses the VitaBuddy pill boxes, is also available to help consumers organize up to 7 days in advance.